That has been my goal from the beginning. To never dwell on the negative, to never give the dark emotions, the hate, a place, but rather to report on the light and love that all men have within them. It can be hard sometimes. There are things I would like to speak out against, but instead I choose to only speak for things. Things that make a man a good man. Finding examples of men to report on can be hard, since we raise people up but men can fall, and we don't seem to help the men on top stay there. I even had to make the decision to not use the word that could and should be used for the values I want to promote - gentleman - because today it no longer means what it once did. Today a 'gentleman's' club is no place for a gentleman, a 'gentleman' is seen as a weak 'gentle' man, a 'gentleman' means a fop only interested in expensive things. And so instead I chose simply Great Men. Luckily there is at least one man I can turn to for inspiration. 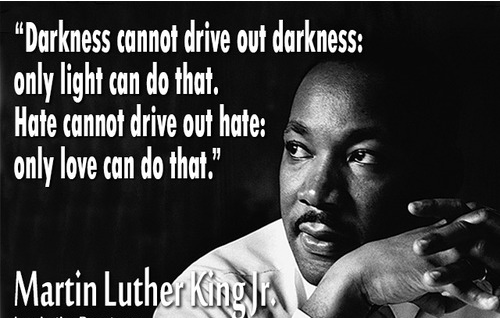 If you want to know what to say and do to be a Great Man, a true gentleman, do what MLK did. If you want to be a real man, even for just one day, be King. To be King you need to lead people, to inspire them, to care for those less fortunate than you. In a time when people may be down on themselves, they lost their job or wages, lost property or the value of their property, their retirement plans are affected, it can be easy to lose sight of your own value. But as King said, your true value lies in the value you can give others, not the value you own. As I spoke about in my Free-lancing article, service and volunteering can be a great way to learn and practice for the next step. It is easy to think of charity, giving, as giving money, but it truly means giving your time, your light, your love, to others to that they can grow and as they do, you will too. And THAT my friends is what being a truly Great Man is all about. So today on the national holiday of Martin Luther King, Jr., but not just today, any and every day, look to King as inspiration on how to live.